School Portraits by Adams Photography, Inc. is a full service photography studio specializing in Pre-K, Elementary and Middle School student photography. We offer several Portrait Programs, tailored to meet the needs of your school. So, whether it's a Fall Program, Dances, Promotions, Graduation or Mini-Grads, we can help! Contact one of our helpful Sales Representatives for a full range of Portrait Programs. With our advanced planning and scheduling, picture day runs efficiently without classroom disruption for a hassle free picture day. 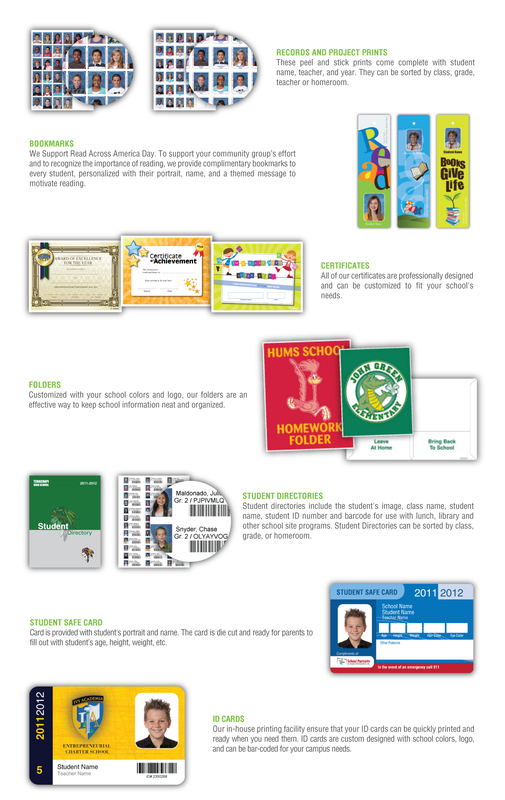 Our easy to understand picture day flyers mean less parent calls to your school office. Our professionally trained photography team and state-of-the-art digital camera systems make certain that picture day goes smoothly and that every student looks their best. Our exclusive Pixel software matches each portrait with the student's data and provides a full screen image of each student so our photographers can see that we have a great image. This means better portraits, fewer re-takes and happier parents. Our promise to you is a timely delivery of all products and services. With one of the most advanced in-house production facilities in the industry, we have complete control over the entire production process. This ensures that your school portraits and service items are produced to the highest quality standards. "What used to be a dreaded event for the office staff has turned into a no-hassle experience." "I give my highest recommendation to Tim Adams and his School Portraits Photography Company." "I am pleased to write this letter of recommendation for School Portraits by Adams Photography. In my twelve years as a school administrator and twenty two as an educator, I have not found a better school photography company. Tim Adams and his staff do a fantastic job. I have used them for both beginning of the year school pictures and the yearbook at two different schools. With regards to school portraits, School Portraits arrives early to set up and is on time for each class. The employees are friendly to the staff and students and listen to each child’s concern regarding their hair, etc. School Portraits works with the needs and time schedules of the individual school. The pictures come back in a timely manner and any problems are dealt with directly with School Portraits and always to the benefit of the student. For our yearbook, Tim works directly with the person heading up the yearbook committee and provides training if necessary and any support requested. The yearbooks are tailored to the specific school desires. Last year, the books came in and we found an error by the printer immediately and got them reprinted and overnighted the new yearbooks to school. I give my highest recommendation to Tim Adams and his School Portraits Photography Company." "Adams Photography goes above and beyond to help make our school events memorable." "Makin g the switch to Adams Photography was truly fantastic. School picture days are well staffed, organized, completed in a timely manner and the staff is friendly and accommodating. The picture quality is terrific and the orders are returned quickly. We use Adams for our yearbook as well. The staff has always been extremely supportive through the process of creating our yearbook as we would in doing it ourselves. The pages are wonderfully colorful, kid friendly and showcase all of our school’s happiest moments. If this were not enough, Adams Photography goes above and beyond to help make our school events memorable. They have offered support in many of our events and have provided beautiful photographs. Adams is a wonderful partner in creating your school memories!" "They have gone beyond normal duties to see that students and families are happy with the quality and service they receive." "It is with great pleasure that I recommend Adams Photography for all of our school’s photo needs. Adams Photography has been reliable, trustworthy, punctual and flexible. They have gone beyond normal duties to see that students and families are happy with the quality and service they receive. Our staff and students are treated with kindness and respect during every visit. Each photo transaction is customer oriented and reliable. Parents are impressed with the pictures and are pleased with the amount of options and/or choices to suit their family’s needs. Many other competitors are impersonal, unresponsive and frankly, don’t care about our students individual needs. Adams is able to handle the volume of prints and attend to our schools growing interest in yearbooks, family portraits, promotion photos and more. After using other companies, I highly recommend to Adams Photography to provide our students and families with quality, caring service with options."